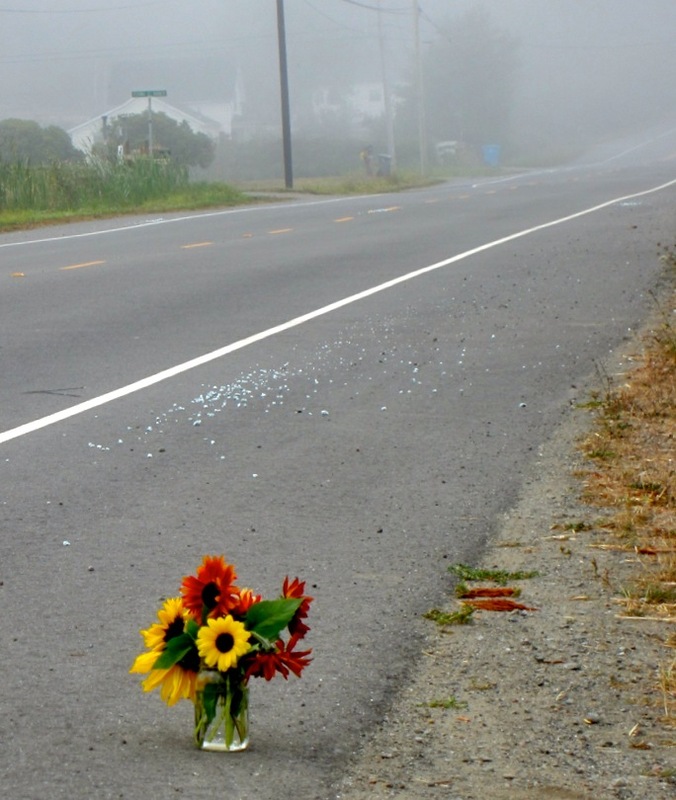 MYRTLE AVENUE – Arcata was wracked with grief and dismay last week after three women were struck and one killed by a hit-and-run driver on Myrtle Avenue Thursday morning, Sept. 27. According to the CHP, at 5:50 a.m., Terri Vroman-Little, 50, of Eureka, Jessica Hunt, 41, of Eureka, and Suzanne Seemann, 40, of Bayside, were jogging northbound on the west shoulder of Myrtle Avenue, south of Ole Hansen Road. For unknown reasons, a 2005 Kia Spectra, driven by an unknown subject, left its lane of travel and struck all three of the female joggers. Jessica Hunt and Terri Vroman-Little sustained major injuries and were taken to St. Joseph Hospital. Seemann sustained fatal injuries and was pronounced deceased at the scene. Additionally, Hunt’s dog, Maggie, was struck and killed during the collision. The driver of the Kia fled the scene directly following the collision. The Kia was later found abandoned by Eureka Police Department officers on California Street in Eureka. Myrtle Avenue was closed for approximately four hours due to the investigation. Monday, CHP spokesman Officer Brent Chase said that a “person of interest” has been identified and is being sought. He declined all further details on grounds that the investigation is ongoing, and disclosure could both lead to flight risk by any suspects and could jeopardize future prosecution. The three women ran the Myrtle Avenue route regularly and were active with the Six Rivers Running Club, which posted several updates over the weekend on its website, 6rrc.com. According to the club, Hunt and Vroman were lodged in the same room at SJHS. Both were in serious condition, but headed for recovery. Support for the victims’ families had been arranged. Later Thursday morning, at about 10:30 a.m., a California Highway Patrol Officer conducting a follow up investigation discovered a deceased female in a residence on Little Moon Lane, Hoopa. The Humboldt County Sheriff’s Office and Hoopa Tribal Police responded to and took custody of the scene. Sheriff’s detectives were notified and also responded to the residence. At 2:50 p.m. a search warrant was issued by the Humboldt County Superior Court and detectives entered the residence. The woman was later identified as Dorothy Ulrich, and HCSO said her death was a homicide. 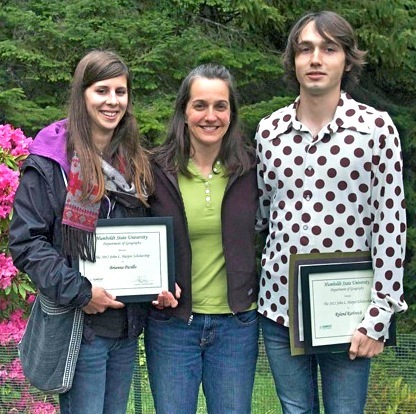 The loss of Seemann sent shock waves through Humboldt State University. President Rollin Richmond called Seemann “an extraordinarily talented and popular instructor” (see below). A wife and mother of two seven- and four-year-old children, Seemann had taught at HSU since 2011, and College of the Redwoods before that. She held multiple degrees from prestigious universities – Princeton, the Massachusetts Institute of Technology and the University of Wisconsin. Geography Dept. Chair Stephen Cunha said he, fellow professors and students were grieving the loss of an extraordinary educator and human being. Cunha noted that Seemann’s dynamism extended to other areas of her life. She was a volunteer in local schools and an accomplished runner. “We were all in awe of this woman – students and colleagues alike,” Cunha said. He noted that Seemann, along with Hunt and Vroman-Little, had all qualified for the Boston Marathon, something many runners aspire to. Blogs and facebook pages were filled with expressions of sadness and anguish over the loss of Seemann and the injuries to her regular running partners. Some suggested that the incident was another reason why an Arcata-to-Eureka trail should be established, to give pedestrians and bicyclists an alternate, car-free route. Third District Supervisor Mark Lovelace said he had heard the suggestions, but that it wasn’t appropriate to leverage the incident for political purposes. “We need to give the families time to cope with this unimaginable tragedy before we start turning it into a cause or drive,” Lovelace said. A memorial service to celebrate and remember the gift of Seemann’s life will be held at Freshwater School on Saturday, Oct. 6 at 10:30 a.m. This entry was posted on Tuesday, October 2nd, 2012 at 5:38 pm	and is filed under News, Humboldt State. You can follow any responses to this entry through the RSS 2.0 feed.